This 1959 film version of General Lew Wallace’s best-selling novel achieved Oscar legend as it went on to win 11 Academy Awards including Best Score for Miklós Rózsa. 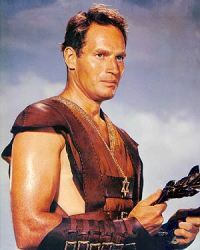 The film tells the tale of Jewish prince Judah Ben-Hur, played in exemplary fashion by Charlton Heston, who lives in Judea with his family during the time of Jesus Christ circa 33 C.E. Judah’s childhood Roman friend Messala returns to Judea as an ambitious Tribune intent on achieving fame and his destiny at any cost. When Judah refuses to provide Messala with the names of local Jewish dissidents, an offended Messala contrives a pretext to exact a terrible revenge. Messala orders the arrest of Judah and his family on patently false charges. Judah is then condemned to certain death on the Roman galleys, while his mother and sister are given life imprisonment. Doomed to die chained to a galley oar, Judah’s hatred and the desire for vengeance fuels his will to live. Soon the hand of fate intervenes and he gains his freedom. Empowered with the help of a Roman General and a wealthy Arab sponsor he returns to Judea and challenges Messala to a chariot race. In an epic struggle Judah emerges triumphant while Messala lays defeated on the track, his body mangled irreparably by horses that trampled him. Meeting for a last time as surgeons wait to amputate Messala’s legs, Judah realizes the hollowness of his victory, of how unquenching it is to drink from the cup of revenge. He leaves Messala to death and rescues his family from a leper colony. Later he sees them cured as the pounding rains born of the crucifixion storm cleanses the sores from their bodies. Ben-Hur is a classic morality tale that will stand the test of time. We observe throughout the film that at crucial junctures in his life, Judah and Jesus cross paths, and with each meeting, Judah is subtly changed. Ultimately this interaction is transformative as Judah overcomes his deep well of hate with the healing power of love. I continue through the many years to find special meaning in this movie with its heart-rending tale of a man’s heroic struggle for justice, as well as its enduring message of the power of faith, hope and redemption. Miklós Rózsa had a contract with MGM which permitted him first choice of any film of his choosing. When Ben-Hur came up he seized the opportunity immediately. Having fully research Romanic culture for the epic Quo Vadis, Rózsa was well prepared to take on the massive canvass Ben-Hur afforded him. He spent a year and a half attached to this project and found much inspiration staying at a villa in Santa Margherita Ligure a resort town south of Genoa on Italy’s west coast. This setting aided him in composing the not only the numerous marches and regal fanfare that fills the film, but also the multiplicity of themes required of this epic tale. Rózsa relates that his greatest challenge in scoring this religious film was creating music for the Christ. He ultimately chose to emote the theme using pipe organ and two sets of violins playing in harmonics to create an ethereal feeling to the music. This approach proved very successful and indeed assisted him securing an Oscar win for best score. It is the consensus of film score historians that Ben-Hur is Rózsa’s greatest career achievement and a milestone in the history of cinema. This is a most complex and rich score with a multiplicity of themes which I have named so as to better guide you through this immense work. So as to present you with a cogent review, I have organized the 80 plus tracks thematically. Rózsa blessed us by joining multiple themes in a number of cues, a testimony to his genius. For such cues I will endeavor to provide a more detailed commentary. So, Let us begin our journey to one of the most profound and moving film scores ever written. The score begins with a wondrous six and a half minute “Overture” that opens with dramatic heraldic power that triumphantly declares with great fanfare, the beginning of a grand tale. As the cue progresses it segues into the Judea Theme, first presented here as syncopated Middle Eastern ethnic writing carried by woodwinds, with plucked strings and horn accents. Soon full strings take up the melody providing a lush and moving statement of the theme. This major theme permeates the entire score and serves to ground us in the culture of ancient Israel. Soon after a transition passage we are provided with the timeless Love Theme, a string and horn carried theme that is noble and passionate in its unquenchable longing for consummation. At the 3:27 mark the music again segues into the stirring string carried and profoundly moving Miriam’s Theme, used to great effect by Rózsa to emote Miriam’s love of her son Judah. For me it is the most emotional theme of the score and emblematic of the core of Judah’s being. At the 4:22 mark glockenspiel and strings announce the masculine Friendship Theme that speaks of the boyhood bond forged between Judah and Messala. And yet we hear within this theme a tinge of sadness and foreboding, a feeling that when the pen has written its last word, we will bear sadness and tears. The overture ends with a muted and subdued restatement of the Judea Theme that seems to slowly fade and dissipate. The second cue “Anno Domini” which translates as “The Year Of Our Lord” also begins as did the Overture with the same dramatic heraldic statement carried by fanfare. As the fanfare fades we progress into the Judea Theme where we hear the violins and bass play a sweeping melodic line that flows with both purpose and beauty, ending with a muted restatement of the opening fanfare. This Judea Theme is also featured throughout the score. In “Entre’Acte”, a short suite, it is carried lightly by plucked strings and woodwinds and then taken up with full expression by strings slowly building to a climatic segue at 1:42 into the Love Theme played by lush violins and French Horn accents. In “Homecoming” the theme, replete with woodwinds, is bittersweet as Judah at last returns to his house, found now is disrepair from his long absence. “Star Of Bethlehem” introduces a third theme, Balthasar’s Theme which is carried by strings, angelic female choir, solo oboe and subtle horn accents. This nine note theme is a leitmotif for the story’s narrator Balthasar and speaks to us of nobility, humility and kindness, fully embodying Balthasar’s on screen gentle grandfather persona. Rózsa fully develops the theme and expresses it with a profoundly moving and emotional statement emblematic of his compositional style. The theme is reprised by full strings with a sense of reverence in “Balthasar”, where we are provided a wondrous interplay with the Judea, Love and Christ Themes – simply a gorgeous cue. Lastly, the theme is presented by acapella choir in the final cue of the second CD “Star Of Bethlehem”. “Adoration Of The Magi” is a joyous cue carried by angelic female choir, strings with solo flute and glockenspiel accents. It is simple and forthright in its testimony to and adoration of the birth of Jesus Christ. The choir gives way to a violin restatement of the Balthasar Theme with choir emblematic of the Magi of which he is one. Sadly, this is the only time Rózsa references this theme in the score. “Prelude” serves as the Main Title of the Film. Borne by regal trumpeting heraldic fanfare and celebratory bells, this fortissimo statement introduces with a cymbal crash at 0:12 the eleven note Christ Theme integral to the film’s Christian narrative. Presented here as an uplifting major key statement it is triumphant, glorious and inspiring. It quickly segues into a brief but sumptuous fragment of the Love Theme which concludes rather abruptly with a restatement of the Judea Theme fanfare. The Christ Theme is the scores’ prime theme and it appears throughout the film in three different expressions; triumphant, ethereal and affirming. “Marcia Romana” or Roman March introduces us to the first of many military thematic variants that abound in this score. Opening with a fragment of the Judea Theme Rózsa introduces a classic march borne by horns and drums. The music is not celebratory but instead determined, willful and its interplay with the Judea Theme emblematic of occupied Judea is brilliantly conceived. Other military references include the “Gratus’ Entry To Jerusalem” a slowly paced, heavy and oppressive march again carried by horns and kettle drums. While with “Salute For Arias” we hear classic and pure heraldic fanfare emblematic of personages of rank and power. With “The Arrest” which opens with shrill dissonance we hear a strident, brutal and aggressive march as Roman soldiers descend on the Hur household with a vengeance to arrest Judah and his family. “Friendship” where Judah meets the adult Messala for the first time opens ominously with dark horns and perhaps portentously with a statement of the Conflict Theme which I will explore below. The solemn Friendship Theme which is carried by strings, horn statements and oboe accents serves to represent the deep bond that made Judah and Messala boyhood brothers. It is measured, firm and masculine in its expression, typical of the deep bond that exists among men that is strongly felt yet never spoken. Sadly life circumstances, adult perspectives and irreconcilable cultural objectives conspire to shatter this bond. This emotional passage is a long one with a solo oboe statement as well as a reprise of the main melody by violins and then horns. The cue ends with the theme becoming slow, heavy with a tinge of sadness. Throughout the film you will hear the Friendship Theme play against the Conflict Theme, serving to evoke the pathos of friends now at odds with each other. Other statements of the Friendship Theme include “The House Of Hur” where it is solemn, welcoming and carried by strings. After a beautiful oboe duet interlude the theme returns to complete its statement. In “Reminiscences” it is contemplative, in “Bitter Triumph” is profoundly sad while in “Aftermath Part 1” it is tragic. Yet this cue displays Rózsa’ mastery for it is ultimately shattering and the theme tortured as Messala contemptuously rejects Judah’s pity with a spitting rejoinder that his mother and sister live in the Valley of the Lepers. “The Conflict” introduces the tragic eleven note Conflict Theme which is emblematic of Judah’s and Messala’s bitter conflict. In the cue, the theme which is sad and heavy, is introduced in the lower registers by bass and dissonant horn blasts and then reprised by cellos. After a transition the cue concludes with a sad rendering of the Friendship Theme which returns like a echo of their boyhood friendship. The Conflict Theme returns often in the score and speaks to Judah’s struggle. In “Revenge” and “Vengeance” it is angry and again juxtaposed to the Friendship Theme while in “The Desert” it evokes futility and the pathos of suffering and despair as the scent of death permeates the music. For “Balthasar’s World” we are treated to a most fulfilling and complex cue that progresses through several themes; it opens darkly with the Conflict Theme which soon gives way a gentle solo oboe interlude which serves to introduce the warm Balthasar Theme. Continuing on we hear the inspiring and ethereal Christ Theme, finally concluding with a solemn rendering of the Judea Theme. In “Hatred” the theme is hardened, dissonant and palpable, playing against the gentle Christ Theme as Miriam tries to counsel Judah. Lastly, in “Sorrow and Intermission” the theme plays against the Judea Theme and ends the cue energetically as Judah’s confrontation with Messala is in the offing. “Esther” introduces Rózsa’s supremely lyrical Love Theme which stands as one of the best ever written. After a warm prelude by violins this lush and sweeping theme features a tender interplay between harp, oboe and strings with ethnic middle eastern accents. Slowly it gains intensity ascending to a climax as Esther and Judah eyes express the love they feel toward each other. The scene is set against the backdrop of Esther telling Judah of her father’s arranged marriage for her. This theme appears throughout the score; in “Love Theme” and “Ring For Freedom” which are contiguous cues the theme is slow and tinged with sadness reflecting Esther’s unrequited love for Judah. Opening hesitantly and fragile with solo vibrato flute it is reprised by the strings, but this time without the passion of the Esther cue. When Judah frees Esther for a life apart from him the theme becomes solemn with an air of resignation. Later in the film with the cue “Memories” it is passionate. We hear beautiful solo vibrato flute and solo violin passages as Esther, who chose not to marry out of her love of Judah, is now filled with joy as Judah and her finally commit to love with a kissing embrace. In “Promise” where Esther promises Miriam and Tirzah to hide the fact that they are lepers. it is tearful as it plays against the lyrical Miriam’s Theme. Lastly, in “Finale” it is joyous. “Escape” is a powerfully written action cue of Judah’s attempt to force Messala to free his family. Propelled by harsh strings and dissonant horns the piece begins a relentless accelerando and gains desperate energy as Judah struggles to at last reach Messala’s private chambers. Within the music we hear echoes of the Friendship Theme suggesting that Judah hopes his friendship with Messala may elicit mercy. The cue concludes with a sense of futility when Judah’s plea is coldly rebuffed. “Exhaustion” and “The Prince Of Peace Part 1” are contiguous cues. “Exhaustion” is just a raging torrent of melodramatic emotional writing for which Rózsa excels. He introduces yet another theme, a seven note theme that I will refer to as the Suffering Theme, a string carried theme which can only be described as torturous. The cue opens with woodwinds coupled with a steady drum beat. Soon we hear the strings take up the theme at first rising in pace and their register, only to then descend which serves to evoke a sense of growing desperation as a parched Judah waits for some water. When Judah is denied water by the guard, he crumbles to the ground as he feels his life ebbing in the burning desert heat. “The Prince Of Peace Part 1” introduces an ethereal rendering of the Christ Theme carried by pipe organ, plucked strings and two sets of violins playing in harmonics. This theme is essential to the story’s narrative and serves to portray the on-going transformation of Judah by the Divine presence. As Jesus fetches water to bring to Judah this sublime statement gives way to a reprise of the tortured music of the exhaustion cue as Judah loses hope and cries out for God’s help. The Christ Theme returns as Jesus provides Judah a drink and segues into a reinvigorated statement of the Judea Theme as Judah’s thirst is quenched and his faith restored. The cue then comes full circle and closes as it began with the Christ Theme. The Christ Theme appears throughout the score, in “The Prince Of Peace Part 2” it plays against the Judea Theme, finishing with a powerful restatement which alludes to Judah’s eventual triumph over his current circumstance. In “The Sermon” it is solemn, affirming and more accessible having lost it’s ethereal quality. Lastly, in “Golgotha” where it plays against the Conflict Theme it is calming. “Roman Galley” introduces two of the three naval oriented themes; the Naval Theme emblematic of the Roman navy, the Rowing Theme that emotes the rhythm of the ship’s oarsmen, and the Attack Theme which as it’s name implies is a robust battle theme. The cue opens with the Naval Theme, which consists of competing repetitive four note motifs playing against each other. Playing slowly in their lower register we have methodical trombones while in the upper register we have harsh ostinato violins playing quickly. At the 0:12 mark the music segues into the Rowing Theme, a methodical and slowly paced statement of repeating triplets carried by trombones with counterpoint provided by harsh grating strings, horn blasts and drums. The cue is beautifully conceived as Rózsa provides the repetitive monotony of a drum beat that is akin to the human heart beat to capture the ship’s pulse; sustained by the unending torturous cycle of the oar-bearers. Other notable cues include “Roman Fleet”, a complex cue that begins with a brief statement of the Suffering Theme followed by a robust reprise of the Naval Theme. Soon it transitions again to the Suffering Theme carried by violas and horn echoes that speak to the misery of life as a galley slave. With “Rowing Of The Galley Slaves Parts 1 – 4” methodical bass and drum play a repeating triplet and are soon joined by cello playing a counter triplet. Within this cue we are treated to an amazing rhythmic accelerando with pronounced basso ostinato and timpani accents. As the Roman commander Quintas orders an increase in speed the counter triplet quickens as the rest of the strings and horns join in. Soon further orders for more speed are made and the bass beat quickens while the music gains greater and greater energy and tension as we see the oarsmen struggling to sustain the pace. The music ultimately ends abruptly as Quintas signals a stop order. In “Rest”, a pivotal scene in the film where Quintas resolves to spare Judah’s life, we first hear a solo oboe play against the muted bass of the rowing triplet. This quickly segues into a variant of the emotional string writing of the Suffering Theme which interplays with the Naval Theme serving to create tension. The cues ends with several dissonant muted horn blasts that fade to nothingness. Rounding up the Naval Themes are six battle cues (“Battle Preparations 1 and 2”, “The Pirate Fleet”, “Attack”, “Ramming Speed”, “The Battle Parts 1, 2 and 3” and “Rescue” that although listed separately on the album are in reality a contiguous 8:47 minute cue. This extended and very complex cue opens with ominous trombone blasts and trumpet counters that raises the alarm and signals the advent of battle. The ensuing bass triplet with string and horn counter play further raises the tension. As the legs of the oarsmen are chained Rózsa again provides the Suffering Theme which emotes with a rising sense of danger and tension. At the 1:13 mark as Judah is spared being chained Rózsa provides emotional string writing that leads us to a statement of the Family Theme which closes with a stirring reprise of the Christ Theme. From here we proceed into some truly kinetic and robust action writing where Rózsa expertly plays the methodical Rowing Theme against the often frenetic horn carried Attack Theme. There is a furious interplay of these competing themes which provides a potent synergy and testimony to Rózsa’s genius for action scoring. The final passage of the cue, which speaks to the poetic rescue of a drowning Quintas by Judah, emotes with a solitary oboe playing against the Suffering Theme and a final blast of the Attack Theme that fades like the fleet in the distance. As Judah prevents a devastated Quintas from committing suicide Rózsa closes the cue with intense and escalating string writing which subsides and then fades to a muted reprise of the Rowing Theme as Judah and Quintas reverse roles. “Victory Parade” which ends the first CD presents the Victory Theme a truly classic celebratory march carried by trumpeting fanfare, strings, drum beat and clashing cymbals. You just want to get out of your chair and join the march! The cue is set to Quintas’ triumphant chariot ride into Rome where Judah partakes in the glory of the victory parade before the Emperor, Senate and people of Rome. It is an honor all warriors dream of, yet few achieve. After extended development of the theme the cue concludes with dramatic trumpeting fanfare as Quintas ascends the steps of the Senate to accept the coveted baton of victory from the Emperor Tiberius. CD two opens with “Fertility Dance” an exotic and spritely dance carried by solo piccolo, castanets and xylophone. Continuing the scene is “Arius’ Party Parts 1 and 2”, which is a pleasant more formal melody presented by woodwinds, tambourine and harp. Later in the touching “Farewell To Rome” sad strings with harp accents play as Judah thanks Quintas for his generosity but takes his leave to return to Judea in an effort to secure justice and save his family. In “Judea Part 1” is multi-thematic and a just wonderful cue. It opens with a lush string presentation of he Judea Theme as Judah has at last come home. Solo oboe and bass then take up the theme which segues into the tender Balthasar Theme as Judah and Balthasar meet for the first time. Next is heard a sad variant of the Family Theme which embodies Judah’s love of is family. The cue continues with a subdued version of the Love Theme now carried tenderly by solo oboe and violins. Dissonant quivering strings follow as Balthasar counsels against Judah seeking vengeance and relates his quest for the living Christ which brings forth from out the dissonance the ethereal Christ Theme to conclude the cue. “Lepers” introduces the Leper motif which plays in the several cues. The motif speaks to the terrible plight that has befallen of Miriam and Tirzah. The motif consists of a single loud dissonant blast of horns and a drum and cymbal echo that is followed by a subsequent four note descending horn blast and drum echo. This motif effectively serves to elicit the horror and terror that the disease struck into the hearts of the uninfected. In “Valley Of Lepers” and “The Search” which are contiguous cues, it is heavy, stark and depressing as Judah discovers the horrible truth that his family is not dead but instead alive and lepers. In the later part of the cue as Miriam convinces Judah to honor their wish to be thought dead we hear the music swells with a fragment of the Love Theme. Continuing on with a dramatic, tortured and climatic ascent of the strings, Rózsa ends the cue in heartache with a restatement of the Conflict Theme which evokes in Judah’s mind the specter of Messala, the architect of this tragedy. The cues “Return” and “The Promise” which are contiguous is for me a highlight cue. Filled with rich lyrical writing, the cue speaks to Miriam’s and Tirzah’s return to their old house. They come to say their farewells after being released from prison as well as to secure a promise by Esther to not to tell Judah that they are alive and Lepers. After a stark opening with the Leper Motif we hear a wondrous progression of major themes featuring beautiful string writing with solo oboe passages that prominently features my three favorite themes of the score; the Love Theme, Miriam’s Theme and the Family Theme. In “Unclean” a hiding Judah is overwhelmed with grief when he hears his mother ask of him. Here Rózsa provides his Miriam’s Theme, first introduced to us in the Overture, which embodies a mother’s unconditional love. It is of all the themes in this score my personal favorite. Opening with repeating lines of the Leper Motif we soon hear at the 1:07 mark the tender theme carried by cello and solo oboe. Full strings reprise the theme with solo violin playing wondrous counterpoint. The cue concludes with cello and solo oboe providing a finishing statement. The theme is also heard in very emotional “Valley Of The Dead” where Judah rescues and comforts his mother. Here the theme carried by violins and solo oboe is tender and tear evoking. In “Tirzah Saved” we hear arising from struggling strings a restatement of the lyrical and devotional Family Theme as Judah searches the Leper caves for his sister this is followed by a bridge passage of the opening heraldic statement of the Overture which is now muted and stripped of its bravado. When last Judah finds Tirzah the Family Theme returns lovingly carried by strings that begin a glorious ascent to a climax joined with horns, yet instead of culminating the music abruptly dissipates. We will next explore a group of related themes I call the Circus Themes, rousing marches which relate to the spectacle and pageantry of the Charioteer race where Judah and Messala at last engage in an epic struggle. We begin with “Panem Et Circensis Marcia” or Bread and Circus, a bravado march which lives up to its name! This cue and two later reprise cues opens energetically with rousing trumpet fanfare, a determined drum beat and clashing cymbals. A variation of the opening theme continues the pace until the primary theme returns anew to complete the cue. “Parade Of The Charioteers” is a score highlight and one of the best marches Rózsa ever wrote – the “El Cid March” being in my opinion his best. Rousing fanfare opens the cue providing a sense of magnificence and grandeur. After three cycles of the theme we are treated to a fanfare display that features a primary trumpet line played against a secondary contrapuntal horn line – just wonderful! French Horns and trumpets usher in a second march theme with displays some amazing horn writing and energy. The cues ends with a flourish by returning to the opening trumpet line. “The Procession To Calvary” introduces the first of two Passion Of The Christ Themes, a slow and heavy eleven note theme that elicits unbearable sorrow and despair. The solemn cue opens with a Largo tempo with strings playing in their lowest register and a solitary drum beat offset with an echo provided by tuba and trombones. As the opening eleven note theme progresses, the strings begin a gradual increase in tempo and sustained ascent in their register, yet instead of achieving a climax, the theme loses hope, slows, and we hear the strings descend in their register toward a sad ending that cannot be forestalled. “The Bearing Of The Cross” and “Recognition” are contiguous cues which introduce the second Passion Of The Christ Theme. The setting is the agony of the cross; the path of the Via Dolorosa where Jesus struggles to bear his cross to Golgotha. The cue opens with an eight note string prelude that introduces the second theme which begins with an initial sad statement by woodwinds and a reprise by strings. But the melody is temporarily interrupted by a series of dissonant horn blasts before resuming, this time with harsh horn accompaniment. At the 1:04 mark the melody becomes tortured as string dissonance returns with drum echoes. The tempo of the music begins to both slow and descend in the string register until the bass dominate. One feels that life is ebbing, that the end is near, and yet once again the theme returns rising out of the lower register once more. At the 0:28 mark of the Recognition cue Jesus falls and Judah rushes to him with some water. As their eyes meet a profoundly moving connection is achieved as Judah recognizes Jesus as the man whom gave him water. This meeting for Judah is transforming and perfectly supported by Rózsa with the transient serenity of the Christ Theme. But the moment is short-lived as Jesus is brutally forced to resume his path. In “Aftermath 2” as Judah sees Jesus being raised up on the cross the Conflict Theme returns in a sad and tragic and sorrowful interplay in the lower registers with the Friendship Theme. A solo oboe carries the music, slowly ebbing away as life passes from Jesus. In the penultimate cue “The Miracle” is a profoundly moving and tear filled scene where Miriam’s and Tirzah’s lesions are cleansed from them by the healing rains spilled by Heaven following the crucifixion. Rózsa provides us with a joyous and refulgent rendering of the Christ Theme which resounds as horns and bells join in a glorious celebratory statement. Our journey ends with the complex and wondrous “Finale”, which opens with a warm and satisfying rendering of the Friendship Theme. Soon follows a muted and restrained return of the five note declarative theme that was first heard in the score’s Overture. From here played softly by solo violin is a non-ethereal and therefore more accessible statement of the Christ Theme which segues into the flute borne Love Theme. As the Love Theme progresses it in turn segues into Miriam’s Theme that begins ascending in the register picking up both choral accompaniment and intensity in the process. The passage ascends higher and higher to achieve a breath-taking climax with a grand statement of the Family Theme crowned and coming full circle to close the story with choral flourish of Alleluias set to the opening five note Theme. This two CD booklet set contains all the cues including outtakes used in the film. The restored stereo sound is good and the booklet extensive, detailed and quite informative. My only criticism is that many sequential cues that should play seamlessly as a single cue have broken ends that produce a slight skip as you transition to the next cue. Also some of the minor cues are truncated, and so never end properly. To purists this will detract from the listening experience. For those like me also interested in a release that provides the score with a more concert piece presentation I recommend the two CD box set “The Complete Music From The MGM Presentation of Ben-Hur” produced by Sony Music. It is my view that this is the most thematically and melodically complex film score ever penned by the hand of man. The full spectrum of human emotions are captured, perfectly emoted and expertly attenuated to the film’s imagery. I consider this score Rózsa’s Magnum Opus, one that I believe gains him immortality, and so I assign it my highest rating, a masterpiece. This is excellent timing Craig, just the other day I stumbled across this CD on special in a local store and made it my fist purchase of a classic score from this time period. I bought it blind as I had not seen any reviews of the score, but now you have me very excited to listen to it. Agreed, it’s one of the greatest Biblical/Roman scores ever written. Now THIS was quality writing. Thanks for the kind words, and thank you again Jon for this great opportunity. Indeed, not to mention how long it took to write it! 88 cues and 15 themes. . . I like to provide film context in the commentary to help the reader better understand the emotional narrative, sort of a liner notes approach. This approach will inevitably lengthen the review. I appreciate that you read it. All the best. Craig this is an excellent and depth review. I can tell you spent a lot of time working on it. I agree with you that this is my favorite of Rozsa scores (although I admit I don’t have too many). 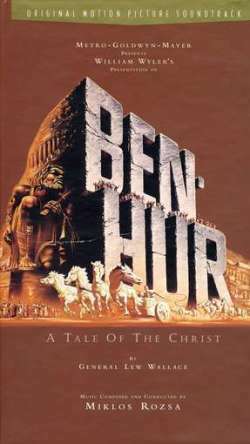 I’ve noticed that many people put “El Cid” higher, but as much as I enjoy that score, I have to say “Ben Hur” trumps it. so yes keep up the great work. I’m longing to read your next review. There are some cues that Rózsa wrote for the film Ben-Hur, but they were never used in the movie. Some of them were recorded, but for some, it is not known if they were ever recorded. you can see and hear how the scene looks like with the music. I so agree with this review of this magnificent score. It is unsurpassed.